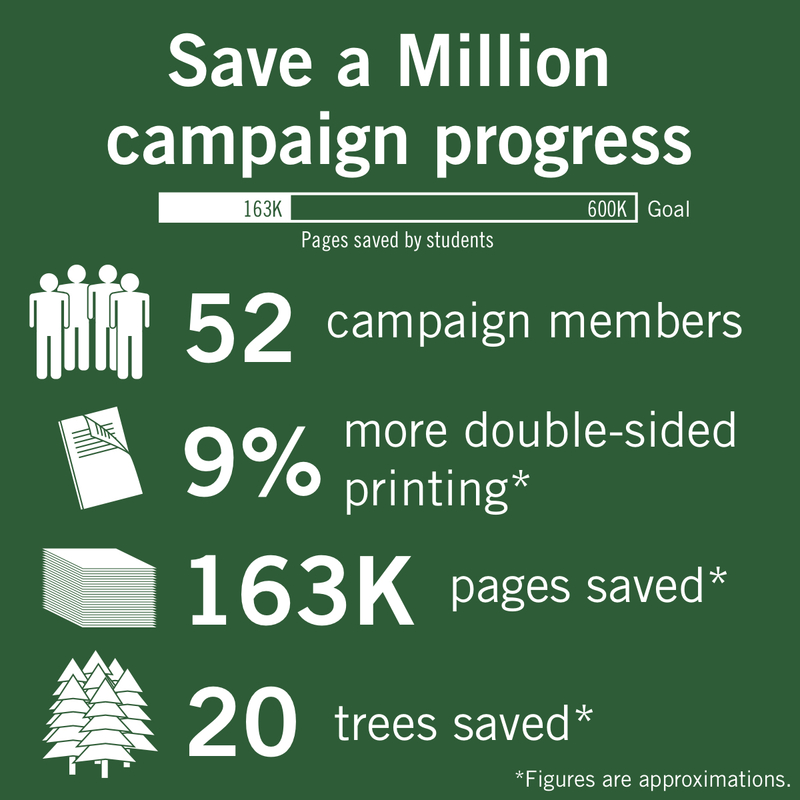 Updated: Jan. 18, 2018 at 3:11 p.m.
One semester after launching a campaign to save 1 million pieces of paper by the end of the summer, the Student Association has reached about a quarter of its student savings goal, but student leaders say they remain confident the effort will reach the million-page benchmark. During the fall semester, printing at on-campus kiosks decreased by more than 160,000 pages, about 27 percent of the 600,000 page student goal, and double-sided printing increased by 9 percent, Logan Malik, the SA’s director of sustainability, said. He said that even though the campaign – pegged “Save a Million” – isn’t currently on track to meet its goal, the first semester was still successful and increased outreach to faculty could still bring the project to completion by the summer. Fifty-two students volunteered for the campaign during its first four months, and the project’s organizers spoke to more than 2,000 students in classrooms, Malik said. Now that the campaign’s posters have been added to WEPA printing stations and organizers continue speaking to students in classrooms, Malik said he expects double-sided printing to increase by 2 percent each quarter, bringing the total expected savings from students to roughly 540,000 pages by the end of the academic year. Malik, who has spearheaded the campaign since its launch in September, said the savings from the first semester show that students are getting involved in the sustainability push. He said that “in the event that we are unsuccessful, we are still incredibly successful,” pointing to the benefits of saving large amounts of paper. The campaign’s cuts to paper usage so far amount to saving 20 trees, 15,523 gallons of water, 9,150 kilowatts of energy and 13,712 pounds of carbon dioxide emissions, he said. The original campaign plan split the goal into savings from students and faculty 60 percent to 40 percent, but faculty paper use will be reported at the end of the year and can’t be tracked quarterly from WEPA reports, Malik said. He said campaign organizers are emailing all faculty members – a continuation of efforts that began last semester – in the hopes that they will decrease the number of pages they print this semester to exceed the faculty campaign goal. “Faculty print upwards of 17 million, so there’s obviously much more potential to save from faculty, and our goal is relatively conservative from faculty at only 400,000 pages,” he said. “Placing a focus on social media networks gives us a chance to constantly remind the student body to be mindful in their printing everyday and everywhere, while also allowing us to continue our outreach more creatively through the use of more interactive media materials,” Le said in an email. Social media allows SA leaders to engage with students who might not have heard about the campaign in person, she added. SA President Peak Sen Chua said he’s proud of what the SA has accomplished during the campaign last semester, and that the progress shows students are aware of the SA’s initiative to lower the cost of double-sided printing. “We’re hoping to continue this work this semester – speaking to students and faculty about the impact of printing double-sided and advertising the campaign on our social media are at the top of the campaign’s priorities,” he said in an email. This post has been updated to more accurately reflect a quote from Logan Malik.